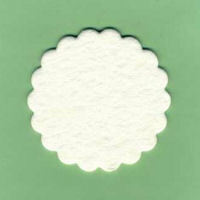 Scalloped Circle Air Freshener Blank *NEW for 2019! Apply fragrance by painting on with an inexpensive paint brush or using a pipette to drizzle it on. We don't recommend dunking or soaking, since over saturating the material with fragrance results in greasy fresheners and will require blotting, which wastes fragrance oil! Punch a hole at the top with a small METAL office-type paper punch. Plastic scrapbook punches may break, due to the thickness of the material. Cut a piece of string, elastic, thread, yarn, raffia or ribbon to the desired length, and thread it through hole at top, knotting ends securely. Package completed air freshener by putting it in a flat cello bag, fold down the top, and staple or tape it closed. You can also use a label to seal it, or staple a fold-over header card or a business card to the top of the bag. Use Fabric Ink Pads to Stamp on your company logo or image or use Iron On Transfers to add one! A great way to promote your business!